Hong Kong-based Artificial Life, Inc., creator of hit 3G mobile games and environments, has come to terms with Sony BMG Music Entertainment in a licensing deal to provide music from the Sony play list to its 3G mobile V-disco product. V-Disco is a wireless subscription site combining chat, music streaming and music downloading to mobile phones with interactive 3D graphics and animated virtual avatars. 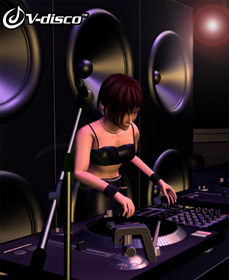 Users and visitors to V-Disco select an avatar for themselves and join the fun. Club-goers choose genres and songs from the club list, listening to their tunes while their avatar strolls along chatting with other party people in real time. In an e-mail to WWJ, Eberhard Schoeneburg, CEO of Artificial Life, said the company is already in testing with operators in Japan and he thought they were not too long away from launch in this market. V-disco users select songs and 3D animated avatars, watching them funk it up on any of several virtual dance floors. “It is a completely new and very entertaining way of presenting and delivering high-quality music to 3G mobile phones,” Schoeneburg commented in a prepared statement. Artificial Life has been working on localizing the product for its Asian and growing European markets by including a mix of international and regional music favorites; V-disco is scheduled for launch in Hong Kong in the fourth quarter of 2005 and the deal with Sony should greatly expand V-disco’s play list. Users in the company’s designated markets can subscribe to the service on a monthly basis to receive a set of songs per month for unlimited streaming. The company is set to debut here in Japan soon. In addition, a selection of the most popular top international songs is offered for a per-stream charge. The company was founded in Boston and has been listed on America’s NASDAQ since 1998. Artificial Life made its name in artificial intelligence and intelligent agent/smart-bot technology. Asia really sat up and took notice when the company introduced the V-Girl (Virtual Girlfriend) mobile role-playing game. These “networked interactive mobile companions” are everything a guy could want in a passive, long-legged lifeform (except flesh and blood). The dating game is designed as an ongoing interactive story that continuously evolves and develops — unlike their real-world relationships, perhaps. Along with the Sony deal, the company has just announced the release of its next key 3G product: V-boy — your virtual boyfriend. The V-boy product line targets a young female audience between 15 and 30 years old (and a lot of other people, as well undoubtedly). Like V-girl, the V-boy product line will be released in three separate volumes. Volume I with 10 game stages is scheduled to debut in an English language version in December 2005.
previous post: Wireless Watch Japan Intelligence from CEATEC :: next post: Mobile Intelligence Japan Wrap!